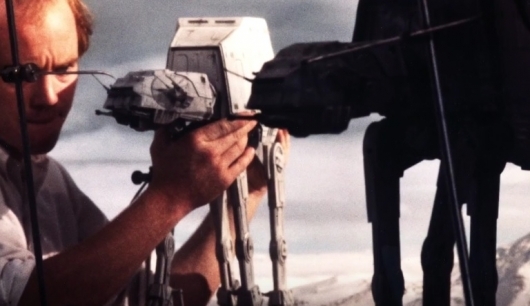 VICE has released a profile titled “My Life In Monsters,” which looks at the life and work of Phil Tippett, the Academy Award winning visual effects artist who has worked on movies like Star Wars, The Empire Strikes Back, Return of the Jedi, Indiana Jones and the Temple of Doom, RoboCop, Willow, Jurassic Park, and Starship Troopers. And yes, he is the very same “You Had One Job” Phil Tippett credited as the Dinosaur Supervisor on Jurassic Park. The profile runs over 22 minute in length, beginning with Tippett’s first inspiration to get into the world of stop-motion and visual effects: the work of the great Ray Harryhausen, and more specifically his 1958 film The 7th Voyage of Sinbad and covering some of his most notable work such as the cantina scene, tauntauns, AT-ATs, Jabba the Hutt, and Rancor in the Star Wars universe, ED-209 in RoboCop, the dinosaurs of Jurassic Park, and more. It also looks at his phenomenally dark and twister crowdfunded stop-motion project titled Mad God. Click on over to the other side to watch My Life In Monsters: Meet the Animator Behind Star Wars, Jurassic Park, and Mad God now.